It's hard to argue against the logic that Dwayne Johnson is the biggest movie star in the world these days, especially after a report from last year that revealed he is now the highest-paid actor in all 7 continents. The actor even has a pretty good sense of humor about all of his astronomical success, which is proven in a hilarious new video where he's being pitched a number of ludicrous projects by his "agent," played by Unbreakable Kimmy Schmidt star Titus Burgess. This video shows what sequels to Home Alone, Goodfellas, Napoleon Dynamite and even The Revenant might look like, starring The Rock. This video comes from GQ, as part of the publication's "comedy issue," which starts with The Rock coming in for a meeting with his agent, where he says there are some lucrative franchises being lined up for the actor. First up, Martin Scorsese wants The Rock to star in Goodfellas 2, where he'd play the illegitimate son of Joe Pesci's character Tommy DeVito, who moves to Queens to try and break out as a stand up comedy star. What follows is a brief scene from this "sequel," where The Rock essentially re-enacts Joe Pesci's iconic "how am I funny" scene from the original movie. When that doesn't quite sit right with his client, Titus Burgess pitches another sequel, Home Alone: They Forgot My A-- Again, where he presumably plays a fully-grown Kevin McAllister, originally played by Macaulay Culkin, who gets robbed by a bunch of kids. This is followed by a brief scene where a shirtless Dwayne Johnson reenacts the aftershave scene, and of course, this project isn't right for the action icon, so the agent moves on to the next project, a remake of The Revenant, from the writers of The Notebook, which essentially equates to The Rock making love to the bear, instead of being mauled by it. Exasperated with his options, Dwayne Johnson asks if there are any projects where he isn't cursing, isn't beating up kids and isn't f---ing animals, which leads to the agent's final pitch, and perhaps the most hilarious: Napoleon Dynamite 2. The final segment shows The Rock is seen performing the title character's iconic dance moves to Jamiroquai's Canned Heat, with moon boots and everything. 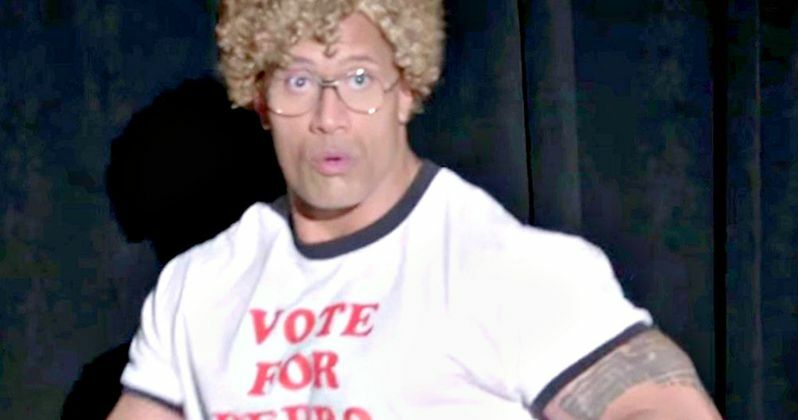 This video isn't the first time The Rock has re-enacted a scene from a popular movie. While hosting Satuday Night Live in 2015, The Rock starred in a skit which depicted a live-action Bambi remake. While the former pro wrestler and current movie icon's career is most certainly skyrocketing, we recently learned that he's considering a different career path. Dwayne Johnson teased in a recent interview that he could be considering a run for President of the United States in 2020, which would oddly enough put him up against another WWE Hall of Famer, current President Donald Trump. Until then, we have a lot more of The Rock to look forward to on the big screen with Baywatch (May 25) and Jumanji (December 22) coming later this year, Rampage (April 20, 2018) coming next year, along with several other projects like Skyscraper, Doc Savage, Jungle Cruise, Shazam and San Andreas 2 in development. While we wait for more on these projects, take a look at this hilarious video below.